Tactical Secure Voice Cryptographic Interoperability Specification (TSVCIS) introduces the Wideband Waveform, which provides the framework for improved speech intelligibility, security, and robustness of defense radio communications. Defense radio communication standards, such as Secure Communications Interoperability Protocol (SCIP) 210 require enhanced Mixed Excitation Linear Predictor (MELPe) vocoder to be implemented in the system. MELPe was designed for a very low bandwidth communications with bit rates of 2400, 1200 or 600 bps. However, as RF and Radio technologies have improved, the bandwidth limitations have become less restrictive. 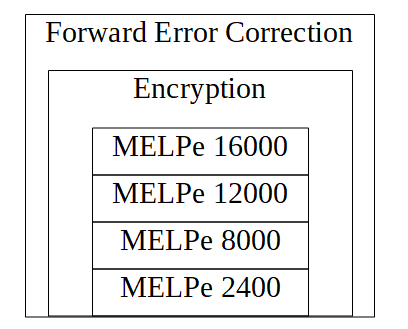 This has allowed radio communication system designers to increase the strength of the cryptography and forward-error-correction(FEC) methods used and has allowed the bit rate of MELPe to be increased. In the Wideband Voice Modes of TSVCIS the bit rates of MELP have been extended to 8000, 12000 and 16000 bps. This allows for the radio users to selectively determine the characteristics of the radio communication. If the radio communication is noisy a lower MELPe rate can be selected and the number of parity bits used for the FEC can be increased. On the other hand, a higher MELPe bit rate can be selected to improve the intelligibility of the speech, if the channel’s error rate is low. TSVCIS was designed to be inter-operable to with SCIP, so the MELPe bit rate extensions were designed to easily switch back to using standard MELPe. VOCAL’s optimized vocoder software is available for the following platforms. VOCAL has updated its MELPe offering to include TSVCIS MELPe variations. In addition, VOCAL also offers FEC software to complement our TSVCIS MELPe. Please contact us for specific TSVCIS codec supported platforms and performance information.